I’m Ajaire from Call Ajaire and I’m very excited to be guest posting here today. As is probably the case for most of the sew along at home-ers, I’ve found Project Run & Play to be an enormous source of inspiration. Now that my girl is a little older I’ve found it is so rewarding to see her run around in something I’ve made. I have so much fun designing an outfit from start to finish, but I’m also so grateful to all of those pattern designers out there. They are a great jumping off point and PR&P’s remix posts are a fun way to take that leap. Today I’d like to focus on a detail I’ve used a number of times over the years. It’s a detail that could be easily added to the neckline of an existing pattern if you’re not feeling brave enough to draft one yourself. It’s lattice smocking. I have found it’s a great way to add a fancy look to a solid colored piece of fabric. 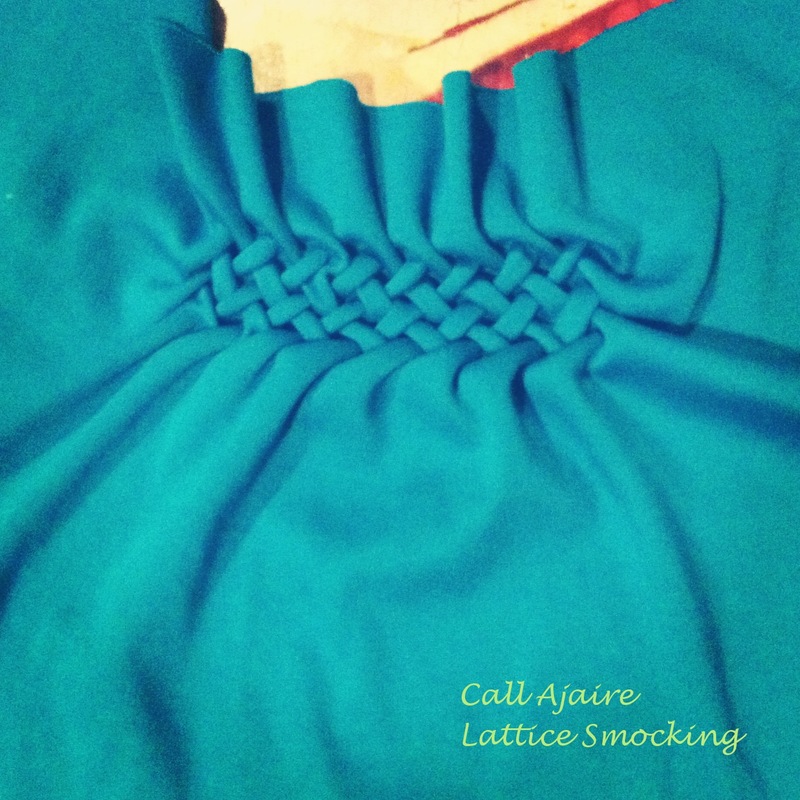 Unlike other traditional methods of smocking, lattice smocking is quick and easy once you get the details worked out. 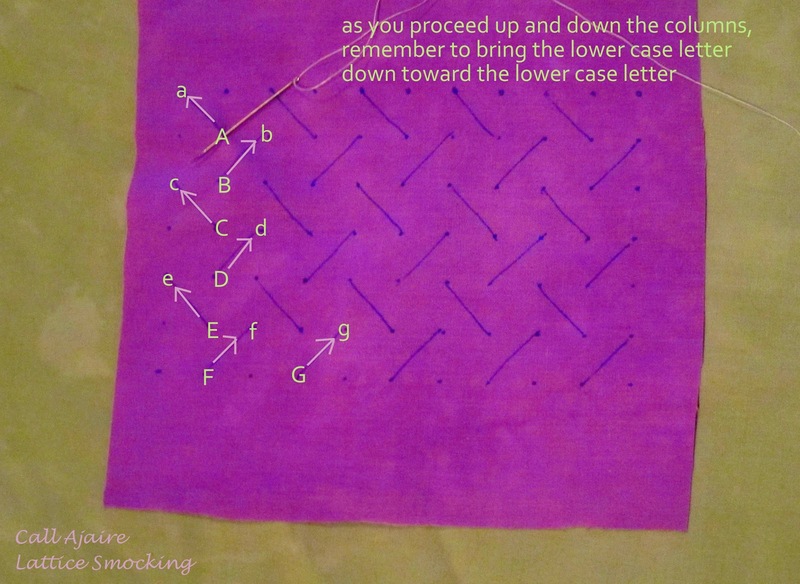 It is worked on the WRONG side of the fabric over a grid of dots and hash marks with regular thread. 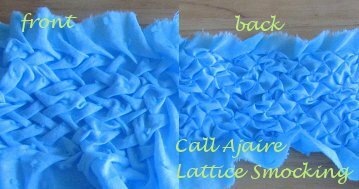 I have finally put my Lattice Smocking Tutorial up on Call Ajaire, so if you’re interested in how it comes together then I’d love you to drop on by. Start with a piece of fabric slightly wider than the bodice pattern you are going to use. Lattice Smocking does shrink the fabric width and length, but not as dramatically as some other types of smocking. I’d say maybe 10-15% shrinkage? So account for that before you start the smocking. Another good idea is to keep the pattern piece close by while you’re smocking so you can check the width as you go. Once the smocking is complete you will take the smocked piece of fabric and place the pattern piece over the fabric making sure that the smocked section is where you’d like it to be along the neckline. It may be a little tricky to get the pleating detail at the top (created by the smocking) to want to play nicely with the pattern, but even a simple gather along edge should be enough to get it to fit in the binding or facing you are using. A big thank you to the ladies behind Project Run & Play. That includes those who are behind the scenes, part of the actual competition, the judges, as well as the sew along-ers. You’ve all been such an inspiration to me. Not to mention all of that fabric I’ve been hoarding stashing all these years is finally getting put to good use too, hehe. Who's that little baby in the green???? Hard to believe that was just a year ago! 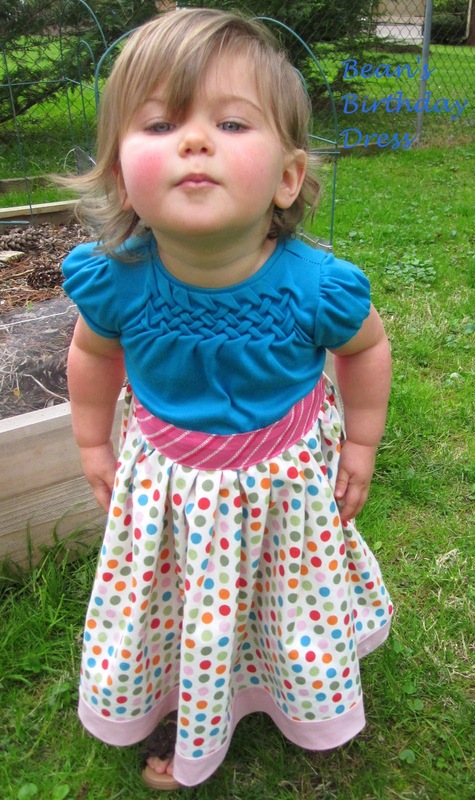 I agree with you that it's so much easier making kid clothes! No weird adjustments, just allow for their height and tummys. I'm not brave enough to try stocking yet, but I love the look! Yours is amazing!!! I have a top that is like this and I've always wondered how they did this! Now I know! I'll be trying this soon. Thanks! Oh she's just so cute! OMG I love this! I smocked a purse before but for some reason haven't thought to do it with dresses, this is so gorgeous and I am totally making something like this!! Do you put something behind it to reinforce it? Some smocks in my purse came out (maybe I just didn't tie good enough knots on the ends) so I fear I would freak out if a dress I made came undone..
HELLO Mark, thankyou. May keep you placed and incorporate my mailing list and your email.